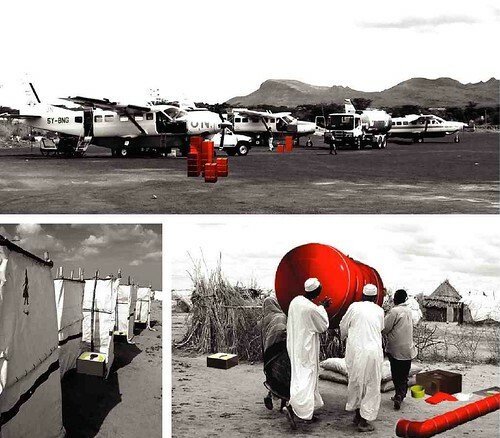 "Blowup/Breakdown is an inflatable, biodegradable septic system that addresses sanitation and environmental issues at disaster relief and refugee camp sites. Fabricated using polyactide polymer (PLA) – a novel bioplastic – the Blowup/Breakdown system safely and ecologically isolates, treats and disposes of faecal waste in emergency situations minimizing human and environmental contact with harmful contaminants." Designed by Studiocycle – and a runner-up at this year's Metropolis Magazine Next Generation awards – the inflatable septic infrastructure has "a useful life of approximately two years." After that time, the whole system "biodegrades into carbon, water and biomass allowing both its components and contents to safely assimilate into the surrounding soil and cause minimal environmental damage to the campsite." 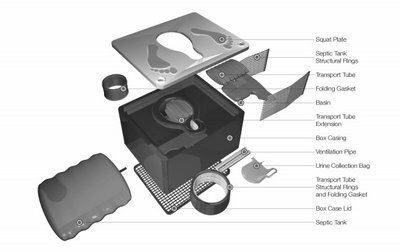 This 10.3mb PDF will tell you much, much more – including technical specs on air pumps, folding gaskets, and structural rings. Are they going to post a calendar inside? Seriously, I wonder if the B/B sytem's urine collection bag and septic tank are far too small. If you have hundreds/thousands of displaced persons, wouldn't you want fewer, sturdier latrines with much greater capacity? If you had dozens of B/B units in use, it would be a full-time job to swap, store, and dispose of the tanks. And if you run out of replacement tanks, then what? ...it looks as if DuPont's first polymer made by life science instead of traditional synthetic chemistry will be a corn-based fiber called Sorona. Soft, springy stuff that competes with polyesters, Sorona is making its first appearance in women's activewear, where its ability to take bright, splashy dyes and resist the ravages of chlorine make it a natural choice for swimsuits. Let's certainly hope so. It might make for some interesting lifeguard duty otherwise. Polyactide polymer (PLA) is made from corn. Has the amount of energy and resources—electricity, fossil fuels, water, fertilizer (still more fossil fuels). etc.—needed to plant, grow, harvest, transport, and process the corn been added into the overall environmental cost/benefit equation? • It has to be composted at 140 degrees for 10 consecutive days. This is not going to occur in a third-world field, but requires specially-constructed (and maintained) recycling facilities capable of anaerobic decomposition. There are perhaps 113 such facilities in the United States: how many are there in undeveloped countries? • How do you ensure that used PLA containers simply don't end up in the average trash dump, where they won't decompose? It's hard enough to get Westerners to recycle trash: is it going to happen in a disaster-torn undeveloped country? If PLA has to be trucked to a proper (but distant) recycling facility, additional money and fossil fuels will need to be spent. • PLA products can lose their structural integrity at temperatures above 100º F, clearly a problem in temperate summers and in sub-tropical/tropical areas. There's no free lunch, even if you can eat the box. cenoxo - In this case, eating the box sounds even less appetizing... Anyway, those are totally genuine concerns, and legitimate points to fold into any future manufacturing of this thing; on the other hand, this is a totally hypothetical project, so there's still time to get the thing put together and functioning in a way more appropriate for its intended use. I have to admit, though, that its use in non-disaster situations is more interesting to me; at the very least, the project would then be more realistic. Inflatable, portable, temporary infrastructure for things like underused summer camps or deep woods cabins - or even raves - aren't entirely useless. You could also dig a whole in the ground, of course, but the future design implications for other inflatable infrastructural projects is well worth thinking about.